Gambling911.com enjoyed yet another winning day, throwing out three free picks. We are now enjoying a 16-4 run over these past two weeks thanks to an Oakland win and the OVER in that game coming through during the final inning. Gambling911.com continues its 14-3 run with a win on the Detroit/New York OVER yesterday. Here are Sunday’s free picks. Don Best TV has your Giants vs. Steelers pick for August 10 Preseason NFL. This is the only game on tap for Saturday evening’s Preseason NFL. It only took 6 innings of the Tigers/Yankees game to tack on yet another win for Gambling911.com’s free Baseball plays Saturday as we are now on a 14-3 run. All free Baseball picks were available in our new Sports Handicapping section here and you can also check out the entire season worth of picks in our Baseball section here. We almost had another one last night with the Detroit Tigers managing to come from behind and tie things up in their final play of nine innings, bringing their game against the Yankees into overtime. In the end, New York prevailed. Let’s look at today’s FREE Baseball play. There were a total of 8 games on tap from Friday night. Gambling911.com hopes to build on its 13-2 run as we head into Friday night with another FREE Baseball pick. Detroit -110 at SportsBetting.com vs. New York Yankees – Be sure to bet this one at SportsBetting since some books had this one over -120. Detroit is looking for its 13th straight win against a team that has lost 4 straight. The Tigers have also won 6 of the last 7 in this series. Don Best TV has your latest NFL Preseason previews and a free pick for Thursday night’s Denver Broncos vs. San Francisco 49ers game. Remember that BetDSI.com is offering LIVE BETTING on most of the preseason games. Gambling911.com has been on a roll with its free Baseball picks just in time for the site to debut its new Sports Handicapping Section. Here, in addition to our own free picks, you’ll be able to view the latest videos from Don Best TV and get game analyses and important “betting value” alerts. 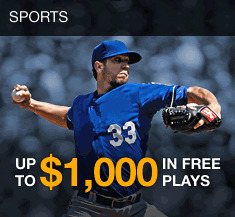 Gambling911.com is attempting to continue its hot streak Thursday with more free Baseball picks as we are currently on an unprecedented 12-2 run. As always you can view our picks in the new Sports Handicapping section or the Baseball section for full season picks. Following word that Texas A&M star quarterback Johnny Manziel may be suspended, Texas A&M odds of winning the 2014 BCS Championship have been reduced to 20-1. Don Best TV has your Dodgers vs. Cardinals free pick for August 7 and this promises to be one of the best games of the night following a series of pitching duels between these two clubs. The Cardinals are a -140 favorite here with Ricky Nolasco starting for the Dodgers and Shelby Miller for St. Louis. LA is a +125 underdog. One of our best showings of the season thus far and we hope to continue this 11-2 run with another of our free Baseball picks. Gambling911.com has your free Baseball pick for August 6 as we are currently enjoying a 10-2 run over the past week. Once again, we are on Detroit as they head into Cleveland with a -105 line at SportsBettingOnline.com. Gambling911.com is now 9-1 with its free Baseball picks over the past week following a statement win by St. Louis against Cincinnati yesterday.